Mario Balotelli scored his first goal since rejoining AC Milan as Udinese slipped into the relegation zone after a fourth straight loss. Liverpool loanee Balotelli broke the deadlock with a superb free-kick. Giacomo Bonaventura volleyed in and Cristian Zapata added a header to extend Milan's lead before half-time. But the visitors had to withstand a stern fightback as goals from Emmanuel Badu and Duvan Zapata set up a nervy finish for Sinisa Mihajlovic's side. Milan have now won three of their five league matches under new coach Mihajlovic. They move up to fourth in the table, behind city rivals Inter, Torino and Fiorentina. Match ends, Udinese 2, Milan 3. Second Half ends, Udinese 2, Milan 3. Giacomo Bonaventura (Milan) wins a free kick on the left wing. Second yellow card to Bruno Fernandes (Udinese). Riccardo Montolivo (Milan) wins a free kick in the attacking half. Attempt missed. Molla Wagué (Udinese) header from the centre of the box is close, but misses to the right. Assisted by Antonio Di Natale with a cross following a corner. Corner, Udinese. Conceded by Diego López. Attempt saved. Bruno Fernandes (Udinese) right footed shot from outside the box is saved in the top centre of the goal. Assisted by Edenilson. Corner, Udinese. Conceded by Mattia De Sciglio. Attempt blocked. Edenilson (Udinese) right footed shot from the right side of the box is blocked. Assisted by Cyril Théréau with a headed pass. Duván Zapata (Udinese) wins a free kick on the right wing. 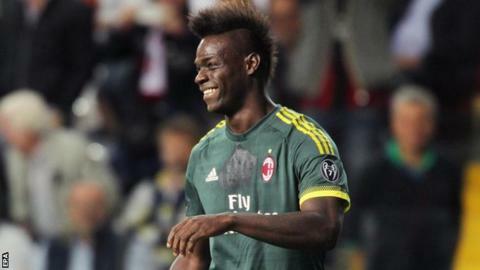 Mario Balotelli (Milan) wins a free kick on the left wing. Emmanuel Badu (Udinese) wins a free kick on the right wing. Substitution, Udinese. Marquinho replaces Manuel Iturra. Luiz Adriano (Milan) wins a free kick in the attacking half. Foul by Maurizio Domizzi (Udinese). Foul by Molla Wagué (Udinese). Substitution, Milan. Luiz Adriano replaces Carlos Bacca. Cyril Théréau (Udinese) wins a free kick on the right wing. Substitution, Udinese. Giovanni Pasquale replaces Ali Adnan.